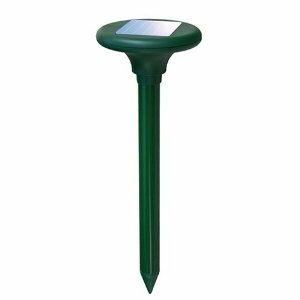 Solar pest repeller keeps voles, gophers, or other rodents from invading your lawn or garden Repels over a 6000 square foot range by emitting an intermittent combination of sound and vibration. Made of durable ABS plastic and corrosion-proof aluminum Completely weatherproof, the repeller works day and night and runs on long-life Ni-Cad solar charged rechargeable batteries (included). Pet and child friendly. This is a no brainer purchase if you have this issue and want it taken care of nicely.